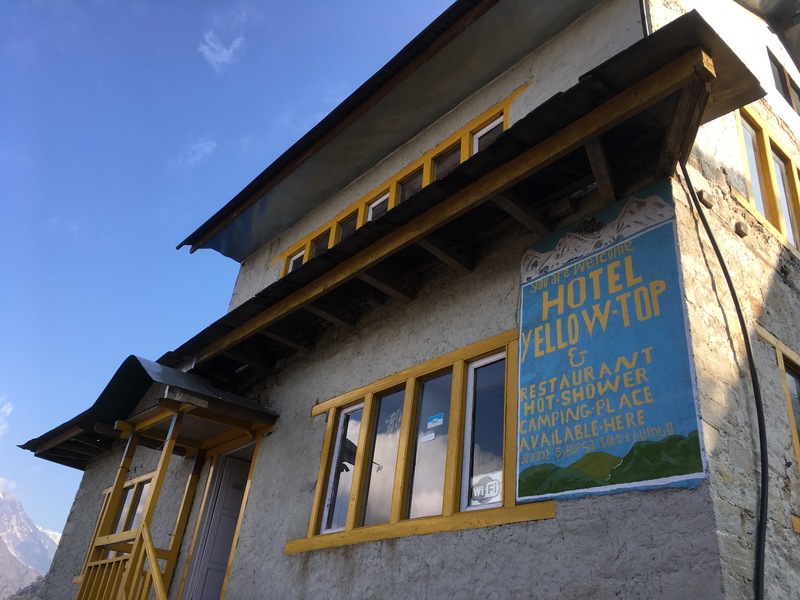 In the morning, we wake in the Hotel Yellow-Top, a tea house owned by a 26-year-old climbing Sherpa who summitted Everest last year and will walk to base camp to prepare for another summit in just five days. He carries around his 13-month son, laughing and rocking the boy and coaxing him to place his palms together and tell us, “Namaste.” The little boy is shy, though, and he hides his face in his father’s down jacket, the father only too glad to hold his son a moment longer before he leaves for the ascent. We ask our host how long it will take to walk from his lodge in Bupsa to our day’s destination, Lukla. He looks at us, thinks about it. “Seven hours for you,” he says. We don’t ask how long it would take him; we know it’s much shorter. The path takes us up and down a forest of red and pink and white rhododendrons blooming in clusters as big as both my fists. Above us, the mountains are cloudy and dark. 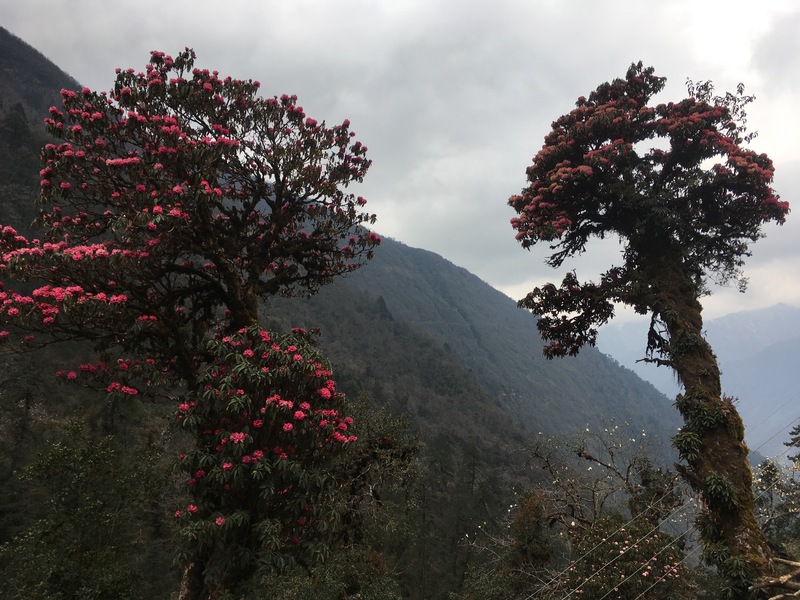 Emma and I see a Nepali man hanging from a towering, twisting tree over an open cliff, chopping away with a dull machete at leafy green branches which glide to the forest floor. We see a white-faced monkey swing from another tall conifer, seeming to fly from limb to limb until his small grey body disappears in the thick foliage. 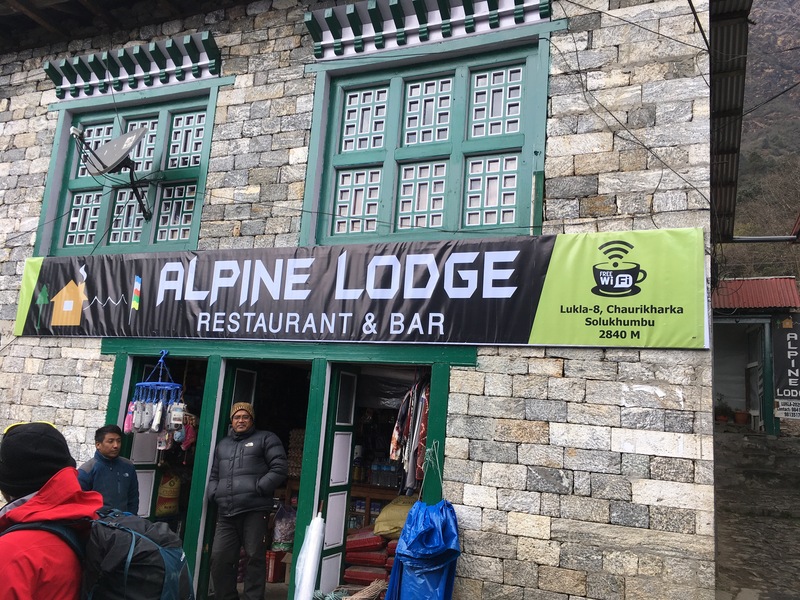 We stop for Sherpa stew and hot ginger tea and, yes, a can of Pringles at a lodge owned by a friend of the climbing Sherpa. In the golden sun, with the hot stew and hot tea to warm our hands and bellies, we are content. The trouble begins in the late afternoon, when we reach the last ascent to Lukla. It is a series of stone stairs cut straight into the side of the mountain, described in my Lonely Planet guide book as “brutal steps!” The sun has already begun to set, and the mountains are a haze of blues and greys. We stop to snap photos. We readjust our packs. We dream of the hot shower and Internet connection and pizza that awaits us several hundred meters above. 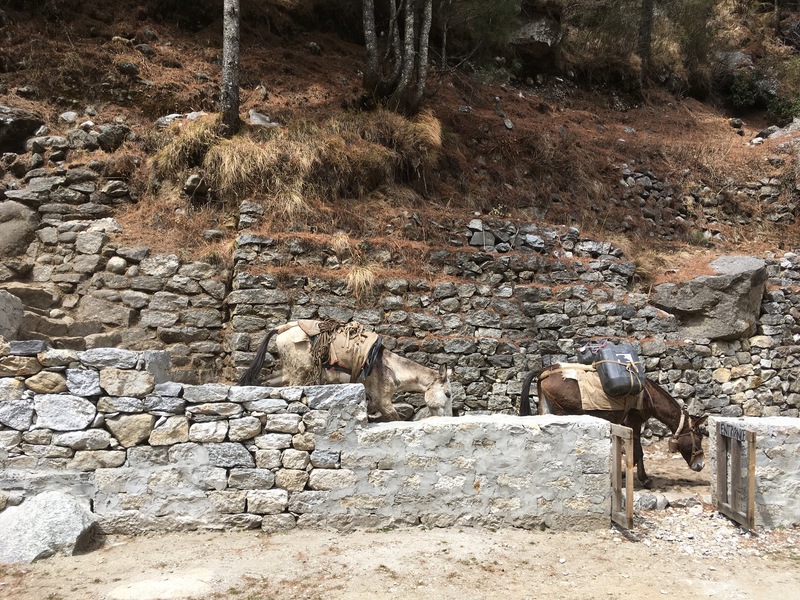 We are so close to Lukla, that larger village in the Himalayas where most trekkers headed to Everest Base Camp begin their trek by flying into the shortest runway in the world. But we are not close enough to outwalk the sun, and when the last of the light begins to fall, we dig through our packs to find our torches. What a difference hiking in the dark makes. The forest, only moments before awash in soft blue light, is suddenly sinister. We climb, and climb, and climb, nothing but the light from our torches upon the slick stone steps. I am hemmed in by darkness. I am one small person on the side of a mountain high above the rest of the world. Our German trekking companion is a formless shape before me, Emma I only sense at my back. It begins to sleet. A crack of thunder roils across the black sky. Faint lights from shanties on the mountain appear on our right and left. People move about inside. I smell incense and curry cooking and hear the murmurs of men and women within, but they seem far away from me in the night. We reach a fork in the path, and do not know which way to go. What at first felt like an adventure suddenly is pure terror. My mind flickers back to a news story I wrote several years ago about a hiker who died when he slipped on rocks much drier and less steep and more visible that the ones I’m on now. We knock on the side of a nearby hut, asking for directions from a Nepali man who does not seem to understand English. Another crack of thunder and lightning splits the sky. A dog — shaggy and grey and more like a wolf than I would like — darts across the path before us. “We need to get out of here,” says Emma, and I totally agree. I’m aware that we are exposed on a mountain during a storm — holding metal trekking poles in both hands. 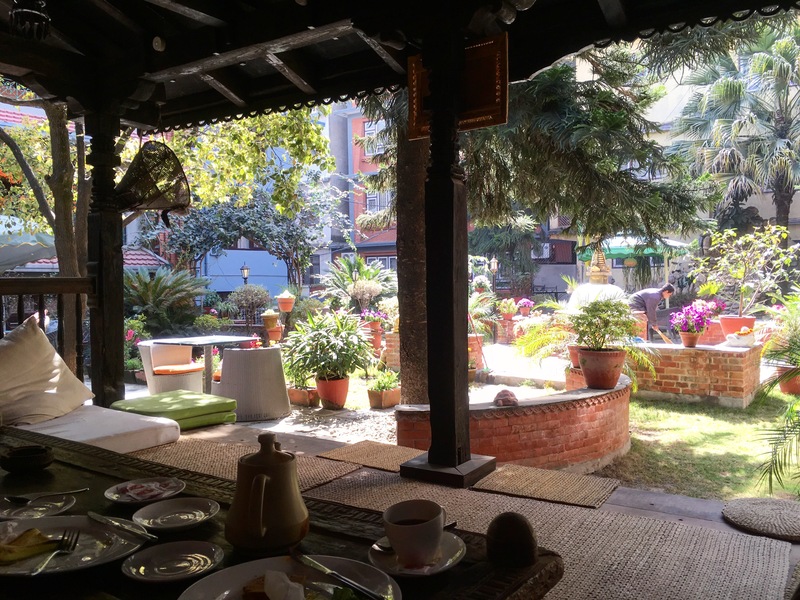 When Emma and I were back in our warm, luxurious hotel in Kathmandu, we commented to each other about trekking during Lent. “It’s a very penitential thing to do,” said Emma, and I agreed. Now, hiking up the muddy slope, I wonder if we are witnessing a glimpse of the reality of Lent, which is really the reality of this world now: walking through the the cold and the wet, with others before us and others behind, so close we can see their breathe but so far that really, we are alone. I have a sense of the deep, mysterious shadow that Christ walked in and we walk in, and it fills me with fear and also an understanding that perhaps on this stony mountain, vulnerable and frightened as we are, we glimpse something true about the nature of the world. Finally, we reach Lukla. 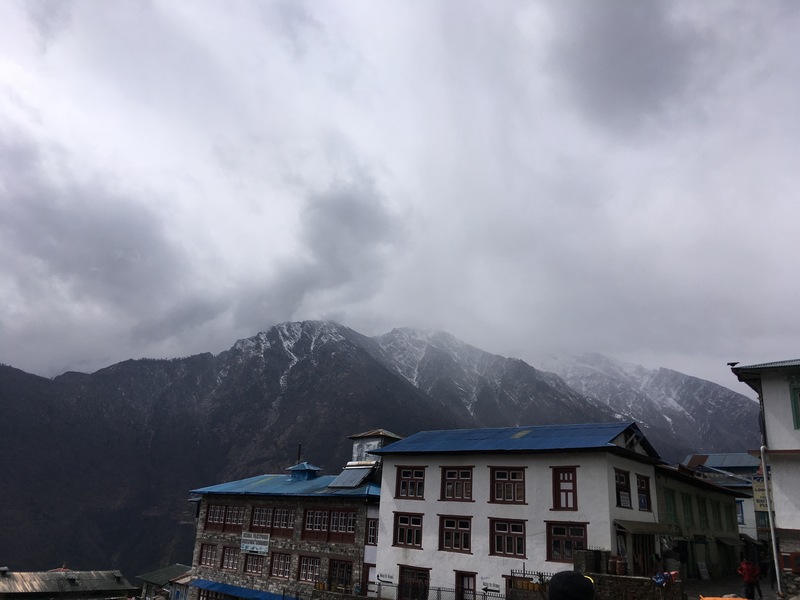 But Lukla is a labyrinth of stony alleyways where Nepali families live behind flapping curtains embroidered with the geometric Tibetan knot. Where do we go for shelter? Where is our hot shower, our pizza, our Internet? We come across a group of men building some kind of stone wall in the rain. I ask them, “Do you know where we can find a lodge?” And one of the men, dressed in flip flops and a puffy jacket over nothing but thin rags, not only points the way, but leaves his task to lead us through the narrow alleys, up and down slick steps, past dogs and coughing children eating dinner on damp front porches until we reach the warmth of the Alpine Lodge. There, at last, are beds with thick blankets and a hot shower and down the street — a pub! We order pizzas and burgers and fries and beer and inhale it all while disappearing into our phones where, for the first time all week, we have Internet. I have never been happier to be warm and safe and sheltered. I am glad our penitential walk — at least this part of it — like all penitential journeys, has come to an end. I fall asleep in a cocoon of down, a hot water bottle warming my feet. Thank you for this bit of beauty. Thank you for taking dear reader on the trek with you. This reader had to stop for a breath or two during the sleet on the mountain! Free WiFi. What more could you ask for …. At that point, not much! 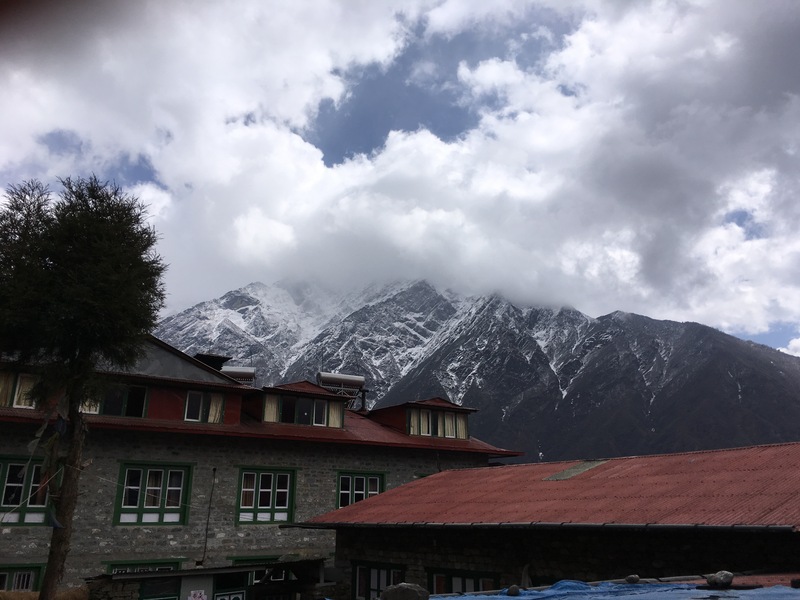 You are currently reading Ascent to Lukla at elizabeth hamilton.